Jones rushed nine times for 54 yards and caught all four of his targets for 24 more yards in Thursday's preseason win over the Jets. Jones agreed to a contract Wednesday with the Eagles, Ian Rapoport of NFL Network reports. Analysis: Jones struggled to find a role with the Colts last season behind the likes of Frank Gore and Marlon Mack, suiting up for only five games after opening the campaign on the practice squad. The 2015 third-round pick finished 2018 with only five carries for 14 yards before getting cut loose shortly after the NFL draft. 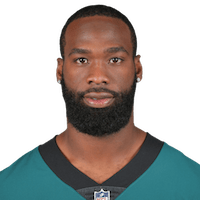 The Eagles quickly picked Jones up after the Colts released him, but it seems like he'll be a long shot to make the Super Bowl champions' 53-man roster this fall. Jones was released by the Colts on Tuesday, Aaron Wilson of the Houston Chronicle reports. 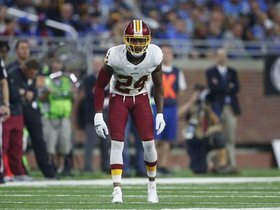 Analysis: A 2015 third-round pick, Jones only lasted two seasons with the Redskins and then spent last year buried on the Colts' depth chart. He has plenty of time to find another team before training camp, but he'll probably be a long shot to make a 53-man roster even if he finds a favorable landing spot. Jones finished the 2017 season with five carries for 14 yards. Analysis: Jones joined the Colts organization just before the season began, and he suited up for just five games as he was often a healthy scratch or a practice squad player. The 2015 third-round pick will be faced with another offseason of fighting for roster spots, whether it's for the Colts or someone else. Jones signed with the Colts on Monday, Zak Keefer of The Indianapolis Star reports. Jones was waived by the Colts on Saturday. 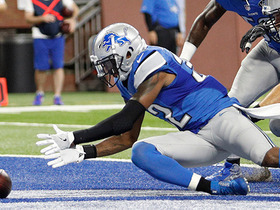 Analysis: Jones was promoted to the Colts' active roster in the latter portion of September. He saw the field in three contests and logged five carries for 14 yards in the process. Assuming he clears waivers, the running back will presumably either return to the team's practice squad or look for a new destination. The Colts expect to have Jones available for practice in some capacity Wednesday, George Bremer of The Anderson Herald Bulletin reports. Analysis: Jones failed to practice Thursday and Friday of last week before ultimately being ruled out in advance of Sunday's win over the Texans. The fact that the running back is set to begin Week 10 preparations on the practice field portends well for his status for the Colts' contest against the Steelers, but don't expect Jones to have much of a role in the team's game plan. Jones (ankle) was ruled out for Sunday's game in Houston. 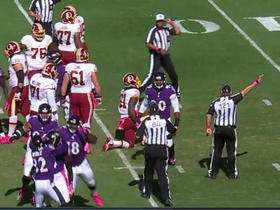 Analysis: Jones didn't practice this week as a result of the ankle injury. The former Redskins running back is positioned no better than third on the Colts' depth chart and won't be in line for many touches behind Frank Gore and Marlon Mack once he's healthy. Jones missed practice Thursday due to an ankle injury. Analysis: The lack of practice participation represents a step back for Jones, who was limited during the Colts' first session of the week. The running back will have one more chance to prove he's reasonably healthy during Friday's practice, but in any case, Jones won't be in line for many snaps behind Frank Gore and Marlon Mack. 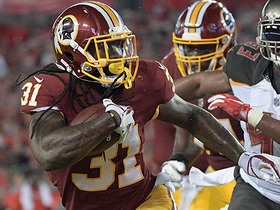 NFL Network Insider Ian Rapoport talks about the Washington Redskins' decision to release running back Matt Jones. Find out what our fantasy hipsters think about the Washington Redskins backfield as we head into Week 9. 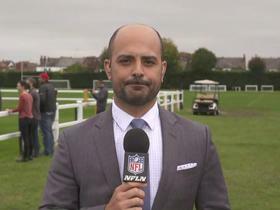 NFL Network's Mike Garafolo reports who will be available for the Washington Redskins against the Cincinnati Bengals in Week 8. NFL Network's Mike Garafolo discusses Washington Redskins running back Matt Jones, cornerback Josh Norman, and tight end Jordan Reed will be available. 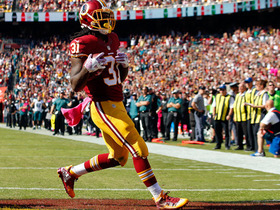 Washington Redskins running back Matt Jones rushes for a 58-yard game to seal the Redskins victory. 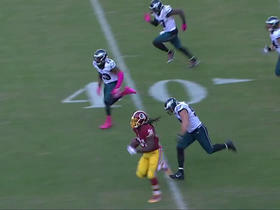 Washington Redskins running back Matt Jones rushes for 1-yard touchodwn. 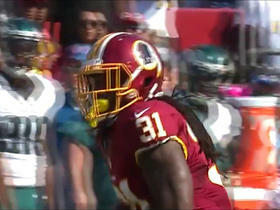 Washington Redskins running back Matt Jones rushes for a 15-yard gain. 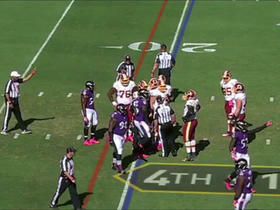 Baltimore Ravens linebacker Zach Orr forces a fumble and recovers it.